In this tutorial, I’ll show you how to build a custom SitePoint search engine that far outdoes anything WordPress could ever put out. 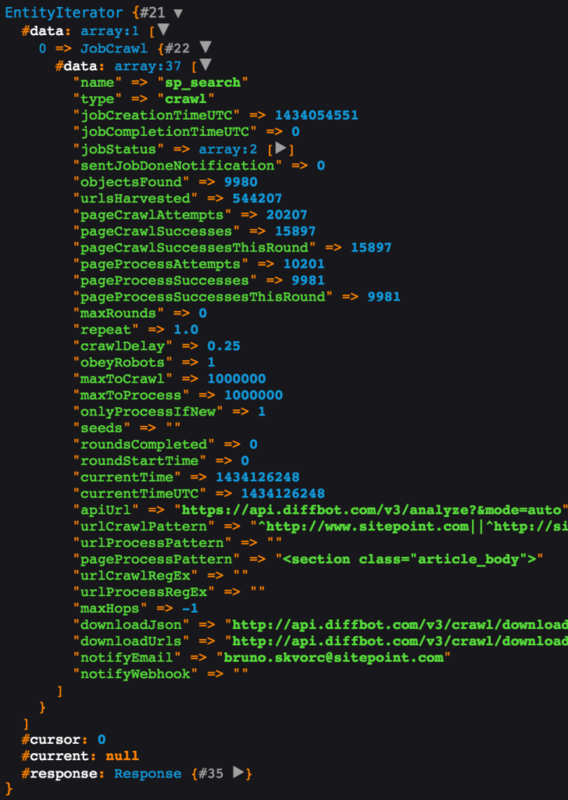 We’ll be using Diffbot as a service to extract structured data from SitePoint automatically, and this matching API client to do both the searching and crawling. I’ll also be using my trusty Homestead Improved environment for a clean project, so I can experiment in a VM that’s dedicated to this project and this project alone. Build a Crawljob which will index and process the entire SitePoint.com domain and keep itself up to date with newly published content. Build a GUI for submitting search queries to the saved set produced by this crawljob. Searching is done via the Search API. We’ll do this in a followup post. It spiders a URL pattern for URLs. This does not mean processing – it means looking for links to process on all the pages it can find, starting from the domain you originally passed in as seed. For the difference between crawling and processing, see here. It processes the pages found on the spidered URLs with the designated API engine – for example, using Product API, it processes all products it found on Amazon.com and saves them into a structured database of items on offer. Jobs can be created through Diffbot’s GUI, but I find creating them via the crawl API is a more customizable experience. In an empty folder, let’s first install the client library. The Diffbot instance is used to create access points to API types offered by Diffbot. In our case, a “Crawl” type is needed. Let’s name it “sp_search”. Then, we make it notify us when it’s done crawling, just so we know when a crawling round is complete, and we can expect up to date information to be in the dataset. A site can have hundreds of thousands of links to spider, and hundreds of thousands of pages to process – the max limits are a cost-control mechanism, and in this case, I want the most detailed possible set available to me, so I’ll put in one million URLs into both values. We also want this job to refresh every 24 hours, because we know SitePoint publishes several new posts every single day. It’s important to note that repeating means “from the time the last round has finished” – so if it takes a job 24 hours to finish, the new crawling round will actually start 48 hours from the start of the previous round. We’ll set max rounds as 0, to indicate we want this to repeat indefinitely. Finally, there’s the page processing pattern. When Diffbot processes pages during a crawl, only those that are processed – not crawled – are actually charged / counted towards your limit. It is, therefore, in our interest to be as specific as possible with our crawljob’s definition, as to avoid processing pages that aren’t articles – like author bios, ads, or even category listings. Looking for <section class="article_body"> should do – every post has this. And of course, we want it to only process the pages it hasn’t encountered before in each new round – no need to extract the same data over and over again, it would just stack up expenses. Before finishing up with the crawljob configuration, there’s just one more important parameter we need to add – the crawl pattern. 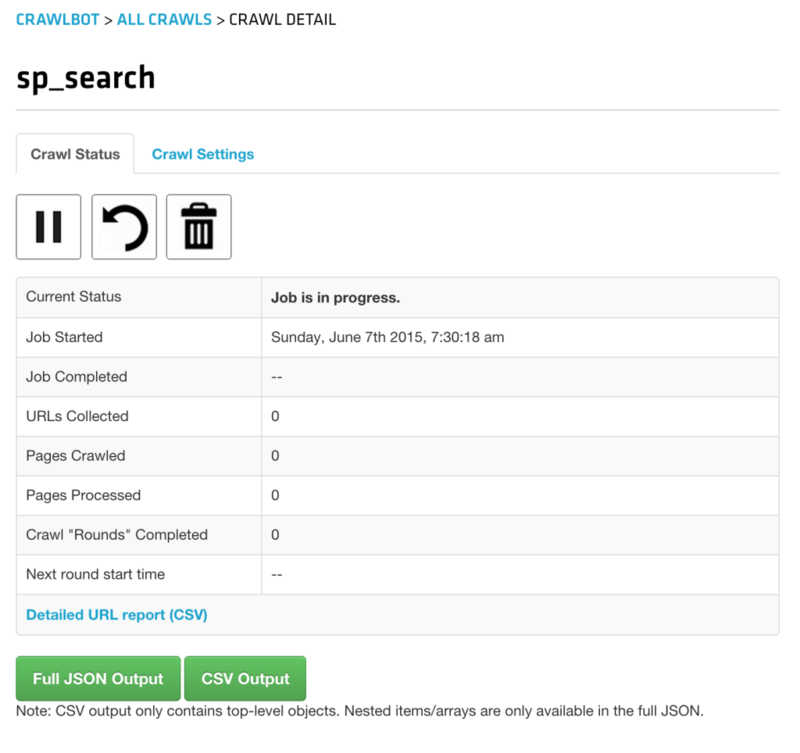 When passing in a seed URL to the Crawl API, the Crawljob will traverse all subdomains as well. So if we pass in http://sitepoint.com, Crawlbot will look through http://community.sitepoint.com, and the now outdated http://reference.sitepoint.com – this is something we want to avoid, as it would slow our crawling process dramatically, and harvest stuff we don’t need (we don’t want the forums indexed right now). To set this up, we use the setUrlCrawlPatterns method, indicating that crawled links must start with sitepoint.com. Now we need to tell the job which API to use for processing. We could use the default – Analyze API – which would make Diffbot auto-determine the structure of the data we’re trying to obtain, but I prefer specificity and want it to know outright that it should only produce articles. Note that with the individual APIs (like Product, Article, Discussion, etc..) you can process individual resources even with the free demo token from Diffbot.com, which lets you test out your links and see what data they’ll return before diving into bulk processing via Crawlbot. For information on how to do this, see the README file. It’ll take a while to finish (days, actually – SitePoint is a huge place), but all subsequent rounds will be faster because we told the job to only process pages it hasn’t encountered before. To search a dataset, we need to use the Search API. A dataset can be used even before it’s complete – the Search API will simply search through the data it has, ignoring the fact that it doesn’t have everything. The setCol method is optional, and if omitted will make the Search API go through all the collections under a single Diffbot token. As I have several collections from my previous experiments, I opted to specify the last one we created: sp_search (collections share names with the jobs that created them). The Search API can return some amazingly fine tuned result sets. The query param will accept everything from common keywords, to date ranges, to targeted specific fields (like title:diffbot) to boolean combinations of various parameters, like type:article AND title:robot AND (overlord OR butler), producing all articles that have the word “robot” in the title and either the word “overlord” or “butler” in any of the fields (title, body, meta tags, etc). We’ll be taking advantage of all this advanced functionality in the next post as we build our search engine’s GUI. With SearchInfo, you get access to the speed of your request, the number of hits (not the returned results, but total number – useful for pagination), etc. At this point, we’ve got our collection being populated with crawled data from SitePoint.com. Now all we have to do is build a GUI around the Search functionality of the Diffbot API client, and that’s exactly what we’re going to be doing in the next part. In this tutorial, we looked at Diffbot’s ability to generate collections of structured data from websites of arbitrary format, and its Search API which can be used as the search engine behind a crawled site. While the price might be somewhat over the top for the average solo developer, for teams and companies this tool is a godsend. Imagine being a media conglomerate with dozens or hundreds of different websites under your belt, and wanting a directory of all your content. Consolidating the efforts of all those backend teams to not only come up with a way to merge the databases but also find the time to do it in their daily efforts (which include keeping their outdated websites alive) would be an impossible and ultra expensive task, but with Diffbot, you unleash Crawlbot on all your domains and just use the Search API to traverse what was returned. What’s more, the data you crawl is downloadable in full as a JSON payload, so even if it gets too expensive, you can always import the data into your own solution later on. It’s important to note that not many websites agree with being crawled, so you should probably look at their terms of service before attempting it on a site you don’t own – crawls can rack up people’s server costs rather quickly, and by stealing their content for your personal use without approval, you also rob them of potential ad revenue and other streams of income connected with the site. In part 2, we’ll look at how we can turn everything we’ve got so far into a GUI so that the average Joe can easily use it as an in-depth SitePoint search engine.